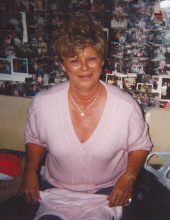 Alma Pauline Lowery Turner, 71, of Elam Rd., Lawndale, passed away Thursday April 4, 2019 at White Oak Manor in Shelby. Born September 22, 1947 in Cherokee, SC, she was a daughter of the late David Franklin Lowery and Flory Roberta McKelvey Lowery. She was retired from Ester Mill. In addition to her parents, she was preceded in death by eleven brothers and sisters. Survivors include her husband of thirty six years, Roger Wayne Turner; two sons, Mitchell Wayne Turner of Lawndale and David Wayne Birch and friend Peggy of Shelby; daughter, Donna Hawkins and husband Donnie of Morganton; two brothers, David Lowery of Shelby and Charles Lowery of Morganton; sister, Juanita Lowery Pickeral of Gaffney, SC; three grandchildren and three great grandchildren. The family wishes to express their sincere thanks to the staff of Hospice Cleveland County and White Oak Manor in Shelby for the care they provided. The visitation will be 1:00PM until 2:00PM Sunday at Stamey-Tysinger Funeral Home. The funeral service will be 2:00PM Sunday at Stamey-Tysinger Funeral Home Chapel. Burial will follow in Kistler's United Methodist Church Cemetery. Memorials may be made to Hospice Cleveland County, 951 Wendover Heights Drive, Shelby, NC 28150 or to the American Cancer Society, 1901 Brunswick Ave. Suite 100, Charlotte, NC 28207. A guest register is available at www. stameytysingerfuneralhome.com. To send flowers or a remembrance gift to the family of Pauline Lowery Turner, please visit our Tribute Store. "Email Address" would like to share the life celebration of Pauline Lowery Turner. Click on the "link" to go to share a favorite memory or leave a condolence message for the family.